The Harlem Park Theatre was originally built as a church for a congregation that had outgrown the size of their existing building. Construction on this Romanesque-style building on Gilmore Street began in the summer of 1902. The building had a Port Deposit granite edifice and was considered aesthetically modern at the time of construction, designed to be an ornament in the neighborhood. The new Methodist Episcopal Church was a short-lived venture marred by two destructive fires that led to its eventual abandonment. On December 22, 1908, the building was almost destroyed in a fire. Repairs were completed to the point where the congregation could continue to use the building until a more severe fire in 1924. On April 3, a fire destroyed the church, and the building was abandoned. This was also the period when the demographics of the neighborhood were shifting from predominately white to predominately African American. The Methodist Episcopal Church was a predominately white congregation, so the change in demographics may have influenced the decision to abandon the church. In 1928, the title for the church was officially transferred to Emanuel M. Davidove and Harry H. Goldberg, who resold the property to their company the Fidelity Amusement Corporation, formed for the purpose of building "a 1,500 seat motion picture theatre for Negroes to be known as Harlem Theatre." The company hired architect Theodore Wells Pietsch, a notable Baltimore architect who also designed Eastern High School and the Broadway Pier. Pietsch took the property's history into consideration when designing the new building: the theatre was made fireproof through the use of steel and concrete, and a fire extinguishing system was also included in the building's design. Like the church it replaced, the theater was designed as an ornament and a spectacle. The building's decorative theme, inspired by Spanish architecture, was considered the most elaborate on the East Coast, and the theatre was promoted as "the best illuminated building in Baltimore." The bright, decorative facade included a 65-foot marquee with 900 50-watt light bulbs to illuminate the sidewalk underneath, as well as "tremendous electric signs" around the marquee and a forty-foot high sign that could be seen from two miles away. "The blazing marquee studded with a thousand lights made the entire square take a semblance of Broadway glamour. The marquees illuminated the entire Harlem Square which was crowded with those who lined the sidewalk unable to gain admittance." A parade was held in tribute to Theodore Wells Pietsch and the construction of the theatre. The parade was both photographed and filmed, and the resulting film was shown at the theatre the next week. After a successful opening, the theatre remained open for nearly forty years. Baltimore citizens remember the theatre with "cavernous three-story high ceiling, a balcony, carpeted floors and thick cushioned seats" and "œcelestial ceiling with twinkling electrical stars and projected clouds that floated over movie-goers' heads." There are also records of community events, such as a free "Movie Jamboree" in 1968 for the children of Baltimore workers donated by the theatre's then-manager Edward Grot, and midnight shows to raise money for the local YMCA. However, the theatre remained segregated throughout is existence and went into decline by the late 1960s. 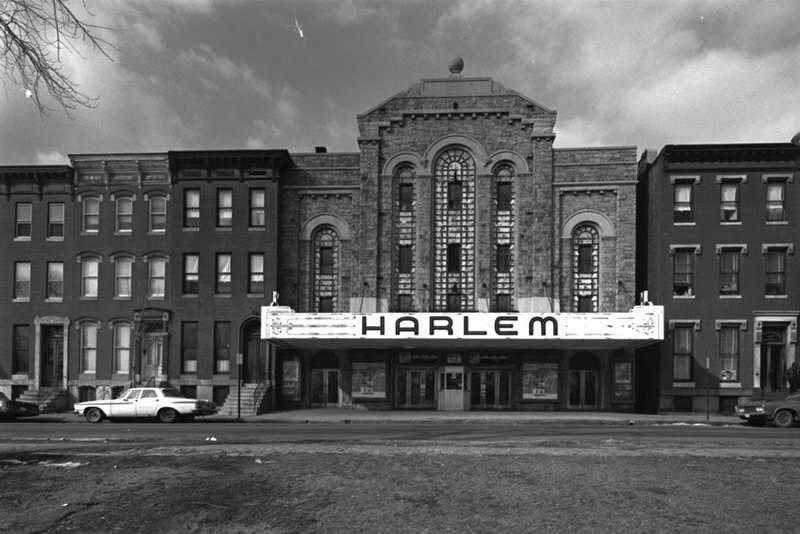 By the mid-1970s, the Harlem Theatre was closed. In 1975, it was purchased by Reverend Raymond Kelley, Jr. with the intention of turning it into the Harlem Park Community Baptist Church. Refurbishment included replacement of theatre seats with pews, and removal of the marquee. On July 6, 1975, the new church was dedicated. 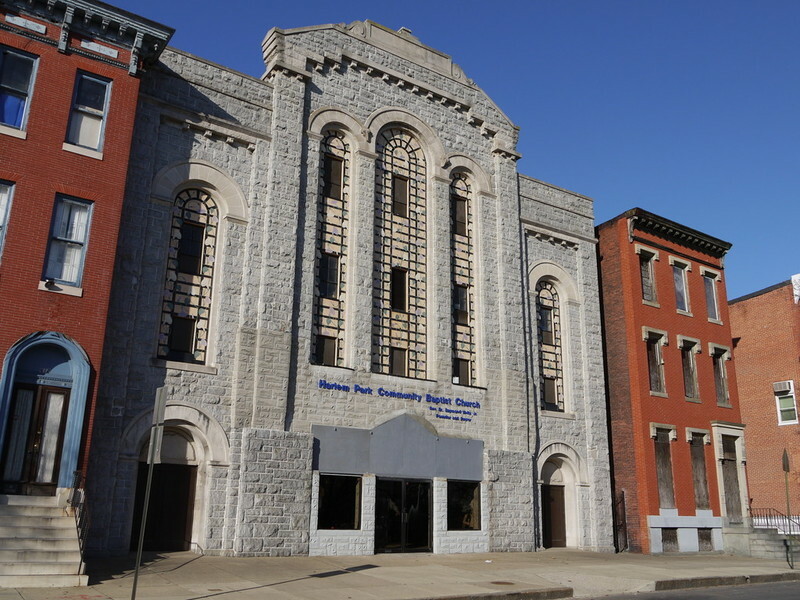 The building continues to be used by the congregation of the Harlem Park Community Baptist Church today. Elise Hoffman, “Harlem Theatre,” Explore Baltimore Heritage, accessed April 23, 2019, https://explore.baltimoreheritage.org/items/show/7. Published on Nov 15, 2011. Last updated on Nov 27, 2018.